Adelaide - Michael Clarke has become the first player to score four double centuries in a calendar year during the first day of the second Test against South Africa on Thursday. Earlier David Warner bludgeoned a quickfire century and Michael Clarke also reached three figures on Thursday as Australia went after the South African bowlers in the second Test in Adelaide. Warner smashed 119 off just 112 balls, while skipper Clarke backed up his unbeaten double-century in Brisbane with another unconquered knock to leave Australia in command after winning the toss. At tea Australia were 280 for four with Clarke unconquered on 104 and Mike Hussey not out 34. The home side added a blistering 178 runs off just 26 overs in the middle session. Warner was in belligerent mood after lunch, smashing spinners Imran Tahir and Faf du Plessis and racing to his third Test century off 93 balls, reaching his hundred with a six and a four off successive Tahir deliveries. The diminutive left-hander smashed a Tahir full toss over the deep midwicket ropes in the first over after lunch and two overs later heaved Du Plessis's first ball in Test cricket over the square leg boundary for six. But Warner perished on 119 when he attempted to glide Morne Morkel through the slips, only to edge to Graeme Smith at first slip to end a pulsating knock. 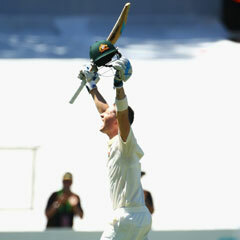 Warner crashed four sixes and 16 boundaries and put on a 155-runs with Clarke in 24.2 overs. It was Clarke's fourth century of the year as he continued to dominate the South African bowlers after his unbeaten 259 in the drawn first Brisbane Test. He survived two referrals and at tea had faced 121 balls with 20 boundaries. It was a rousing fightback by Australia after they lost three wickets in the morning session as South Africa suffered two injuries. Ed Cowan was caught and bowled for 10 off Jacques Kallis's third ball with an attempted yorker which struck him on the boot and spooned up off the bat for a dolly return catch. Rob Quiney, who kept his place when Shane Watson failed to recover from a calf injury, went for an eight-ball duck when Morne Morkel enticed him to edge to Graeme Smith at first slip. Ricky Ponting's woes continued when he was bowled third ball for just four, playing inside Kallis. The former Test skipper was out for a five-ball duck in Brisbane for his third duck in four Test innings against the Proteas, and it was little better in Adelaide for Ponting, who stumbled and lost his footing. South Africa's joy at their early successes was tempered by a hamstring injury that forced Kallis from the field after he had taken 2-19. Star paceman Vernon Philander was withdrawn from the team with a back problem before the start of play, making way for Rory Kleinveldt.